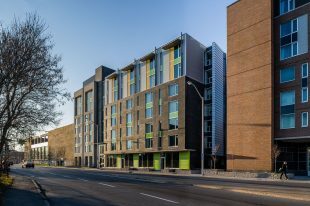 The long vacant Beaver Barracks site occupies half a city block in an area of transition between Centretown and the Queensway. 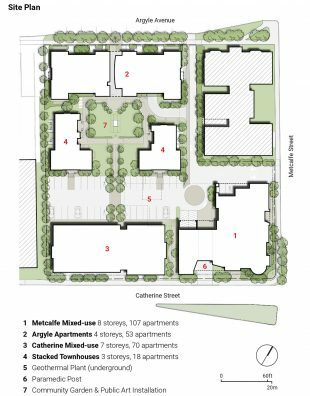 In spite of the presence of the neighbouring Canadian Museum of Nature and the Metcalfe Street access to the Parliamentary Precinct, the area had long been in a state of decline as residential and commercial uses had given way to half empty offices and parking lots. 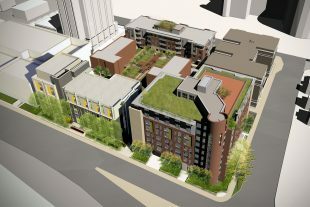 The Beaver Barracks Redevelopment with 254 affordable housing units in five buildings of varied scale and architectural expression constitutes an urban intervention that reverses this decline while acting as a catalyst for a residential resurgence and a landmark gateway to the Nation’s Capital. 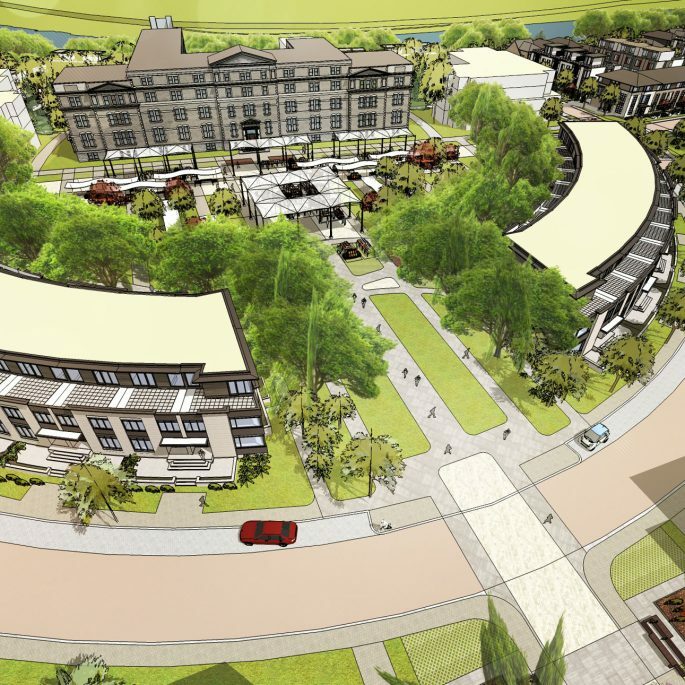 Each of the five new buildings of the development is distinctive. The height, mass and articulation of each building responds to the neighbouring building forms and scale, while working together to frame an outdoor room for the community garden at the centre. 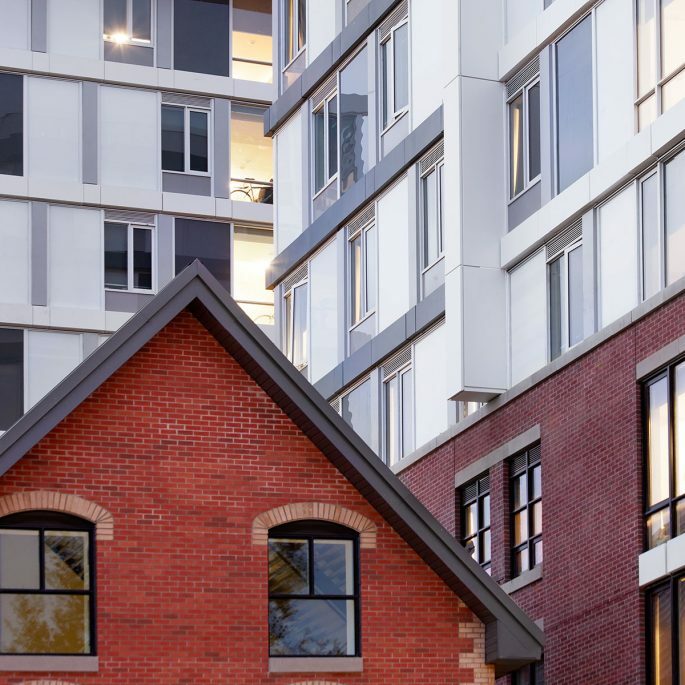 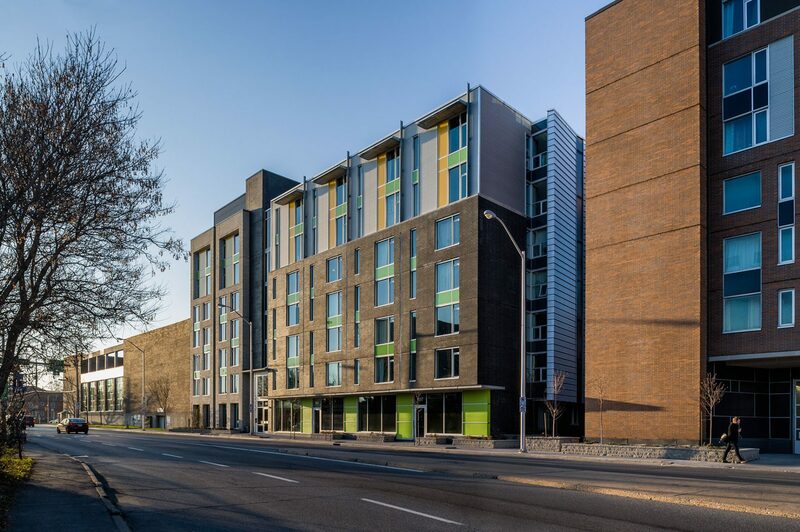 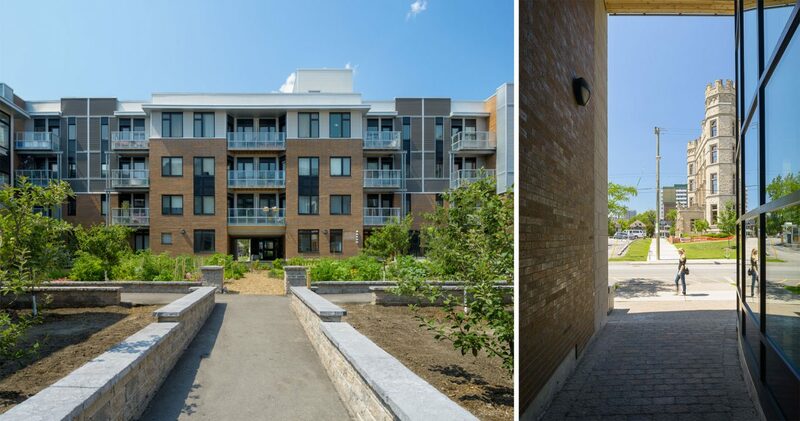 The two tall blocks abutting the Queensway provide strong landmark identity that can be understood in high speed traffic while creating an acoustic barrier to shelter the community garden within. 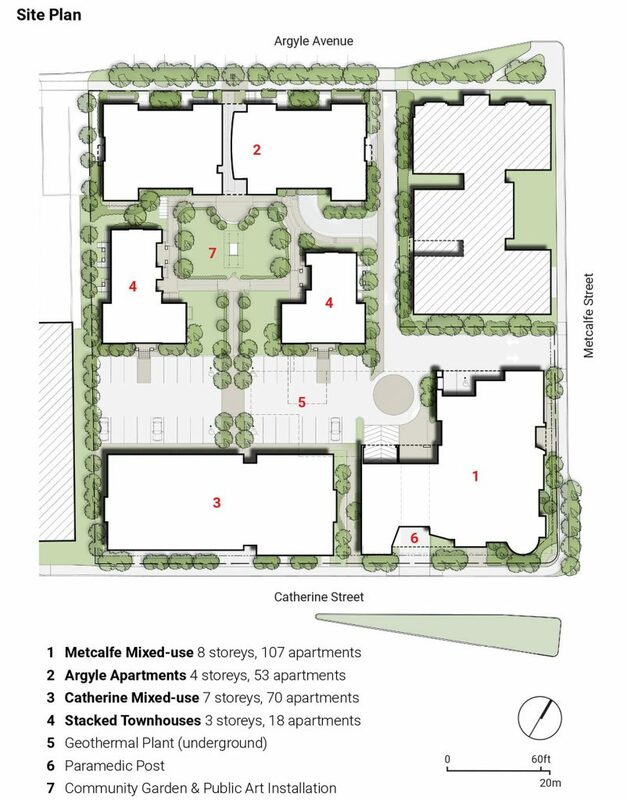 The massing of these large buildings is broken down with the articulation of the facade into narrow vertical bays and horizontal transitions to better relate to the scale of the neighbouring Windsor Arms and the smaller buildings within the development. 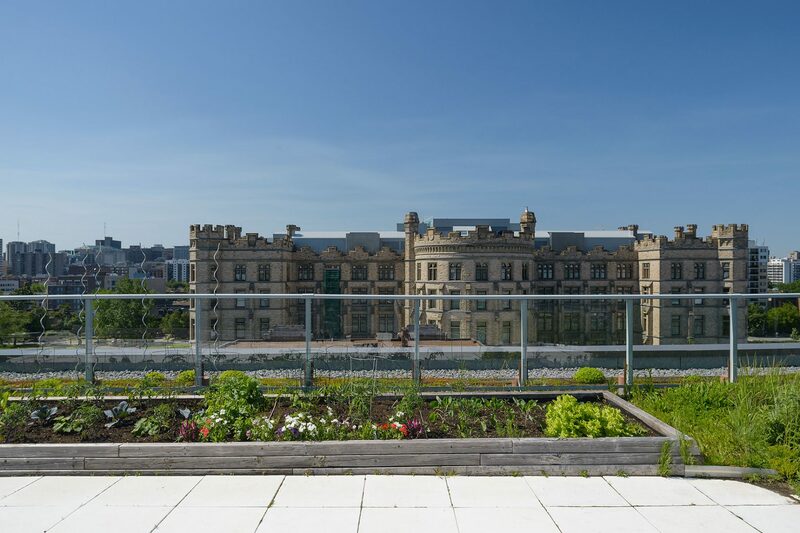 The low four-storey building opposite the museum on Argyle Avenue reestablishes the historical residential scale and formal rhythm of the street while allowing sunlight into the garden court and views out from the taller buildings beyond. 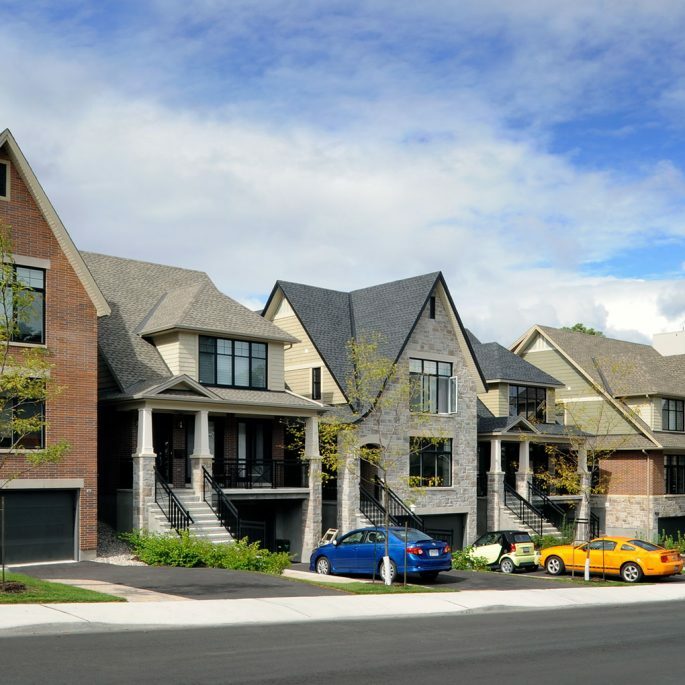 Here, the long north facade is articulated into house sized bays with private entrances at grade. 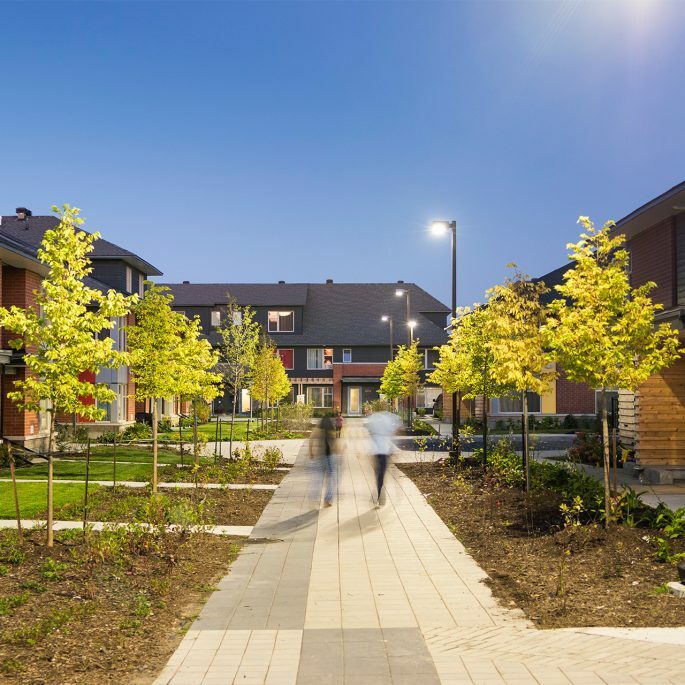 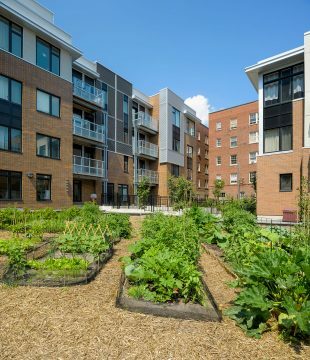 Within the site the scale steps down again with two three-storey blocks of stacked townhouses that complete the framing of the community garden. 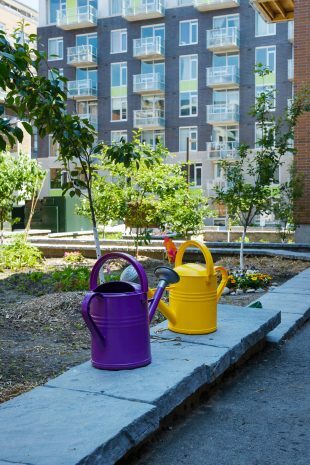 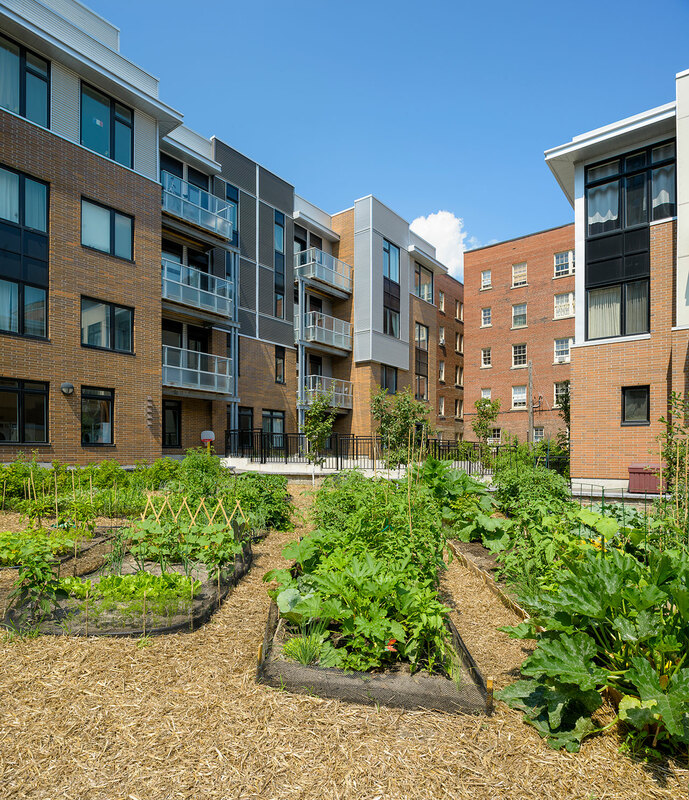 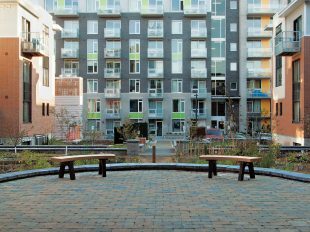 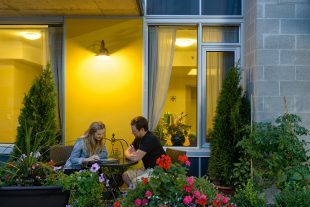 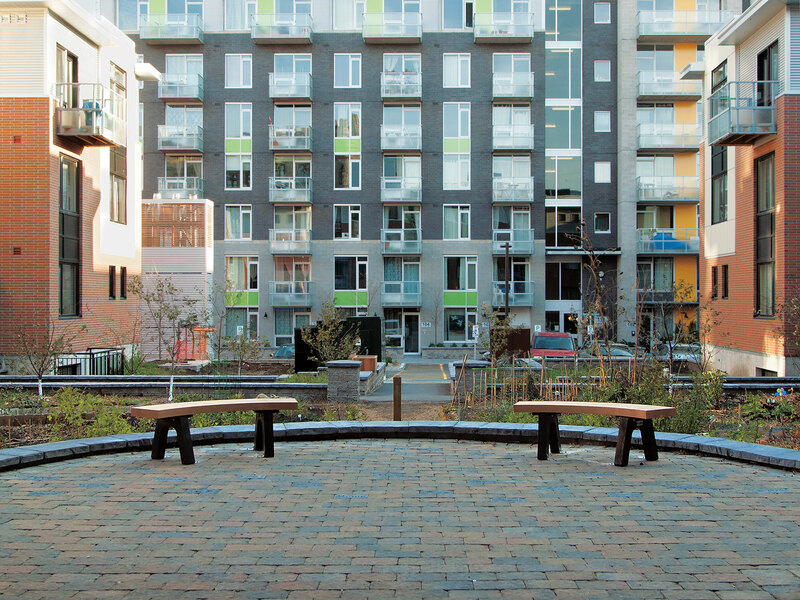 The development draws its organization and its expression from the community garden at its centre. 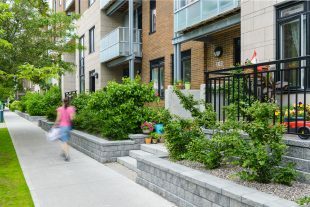 The landscape of the garden extends out to the perimeter street fronts where ground floor townhouse units are accessed through individual private stoops tucked amongst front gardens and street trees. Public pathways transect the site leading through the architectural perimeter to the garden in the centre court and then out again. 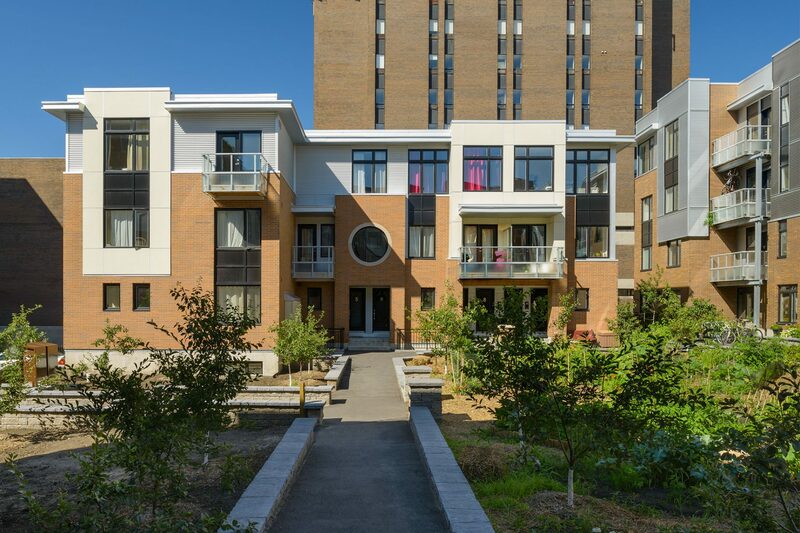 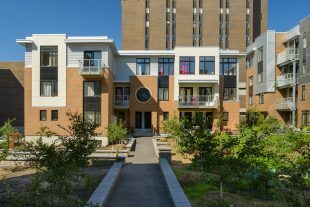 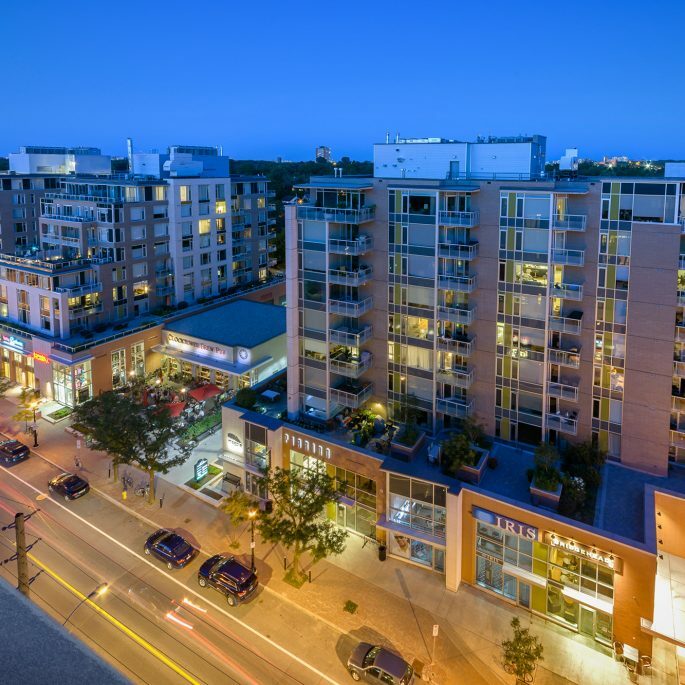 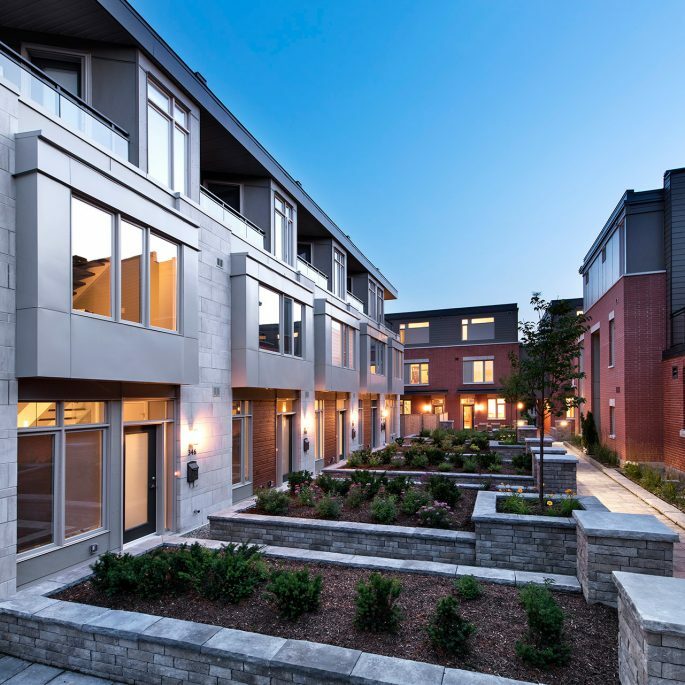 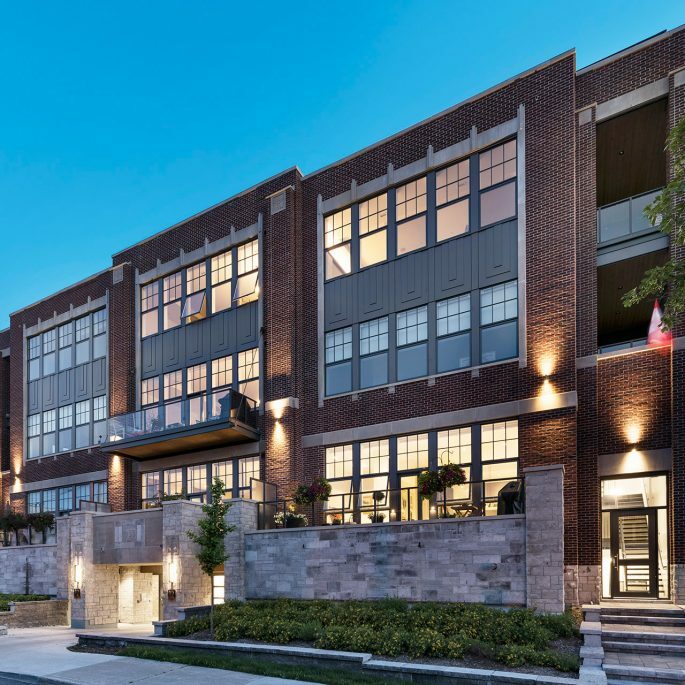 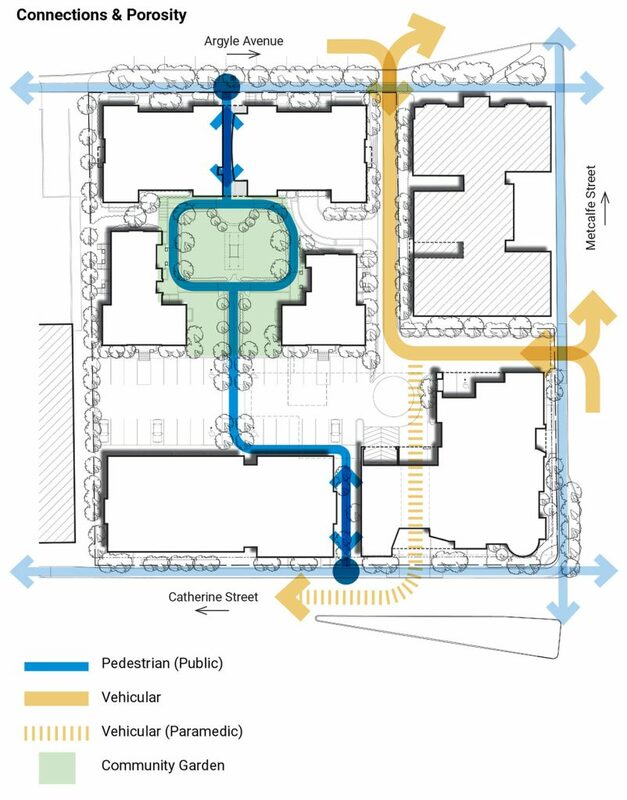 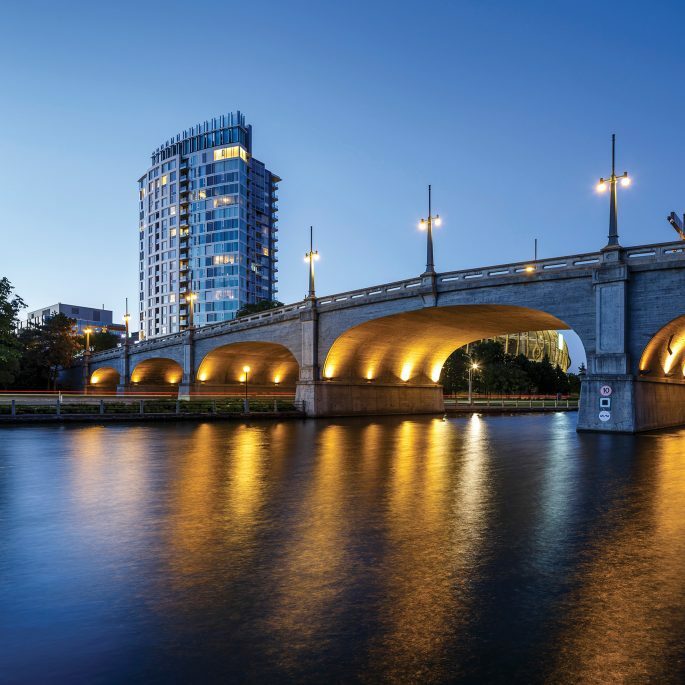 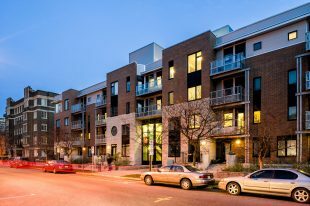 These pathways provide primary access to internal townhouse units as well as the lobbies of all three perimeter apartment blocks, while creating a strong pedestrian link between the Museum and Centretown to the north, and shopping and the Canal to the south. The garden itself is broken into parcels and programmed for children, people with disabilities and general resident use. 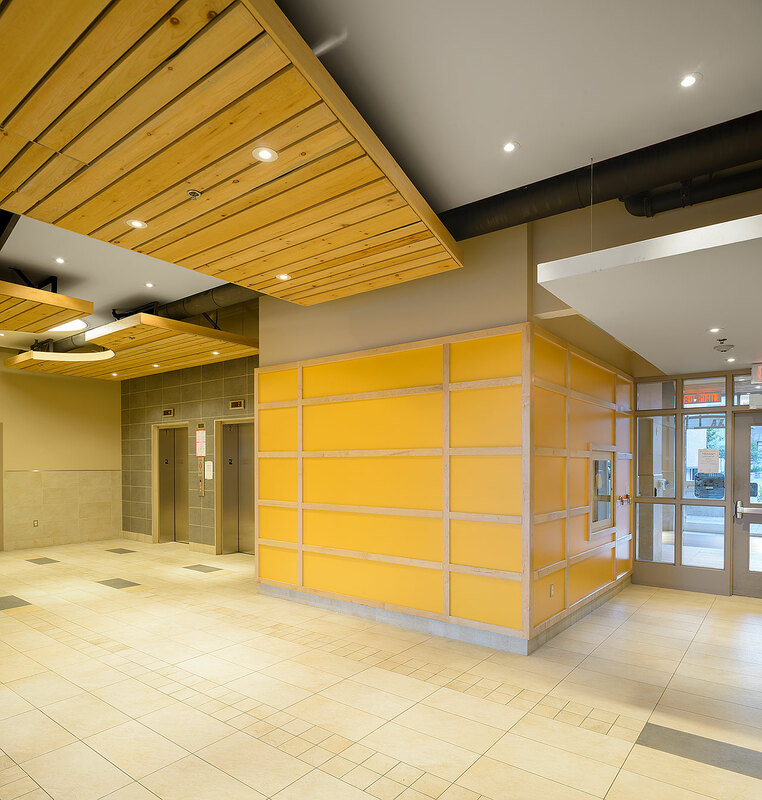 A major piece of public art was installed at the centre of this space following a competitive selection process. The pathway is a vital barrier-free circulation route linking all of these elements while facilitating community. 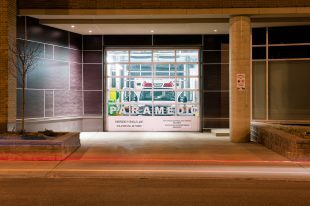 From the outset the site was seen as an important and highly visible urban asset, in spite of the fact that it was encumbered with contamination, poor soils and a small but vital paramedic post. 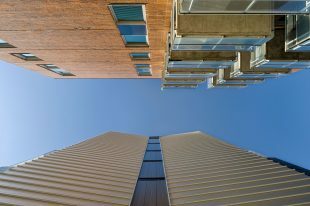 It was understood that with this visibility the development would be seen as an expression of the community and environmental values of its owners. 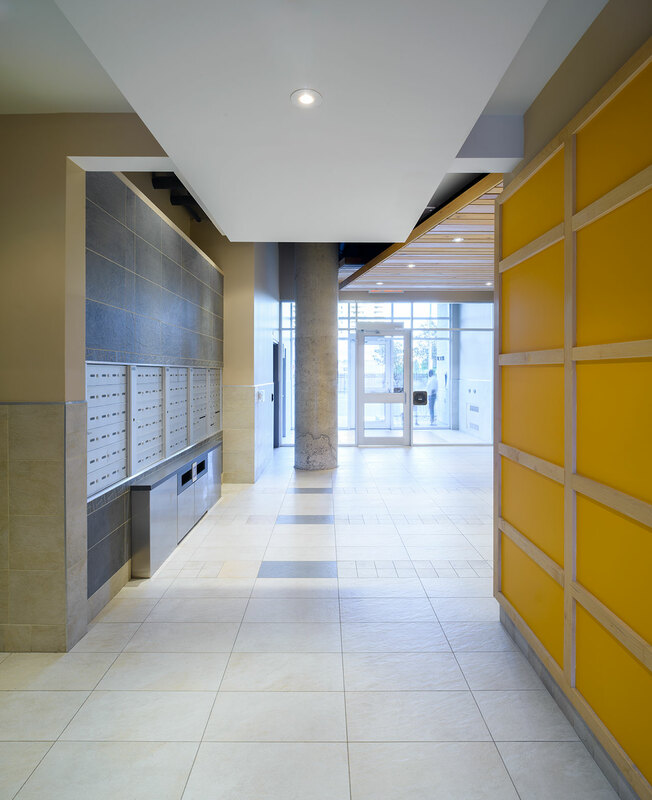 Thus, these encumberances lead to strong themes of sustainable design and integration. 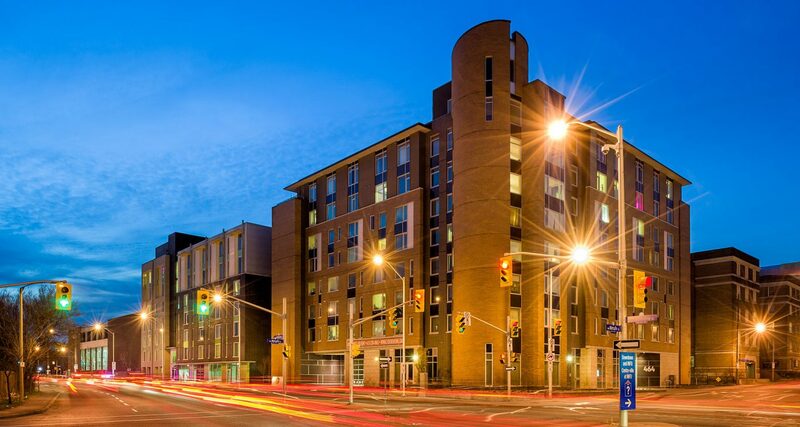 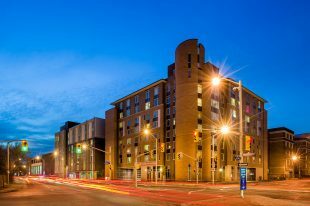 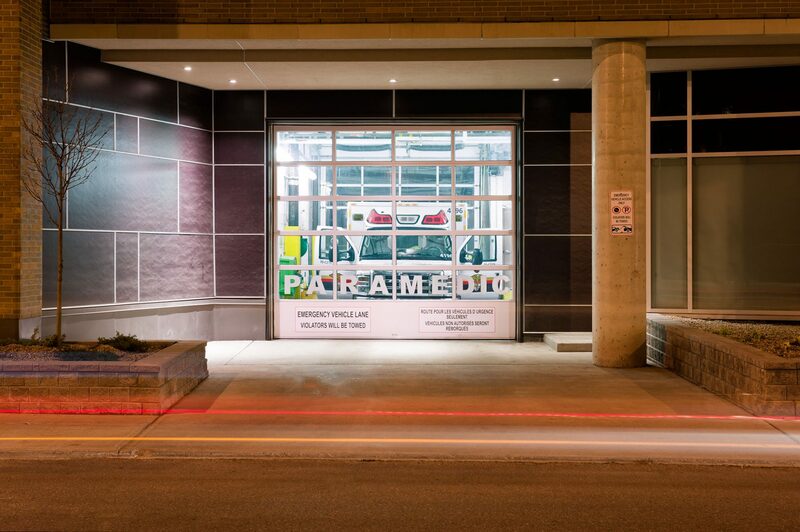 After the site was cleaned up, construction was broken into two phases to permit the ongoing operation of the existing paramedic post while a new facility was integrated into the eight-storey Metcalfe building. 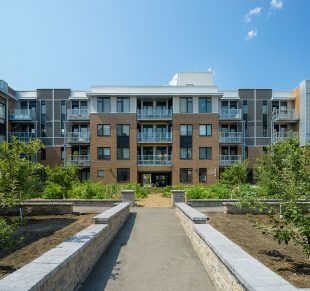 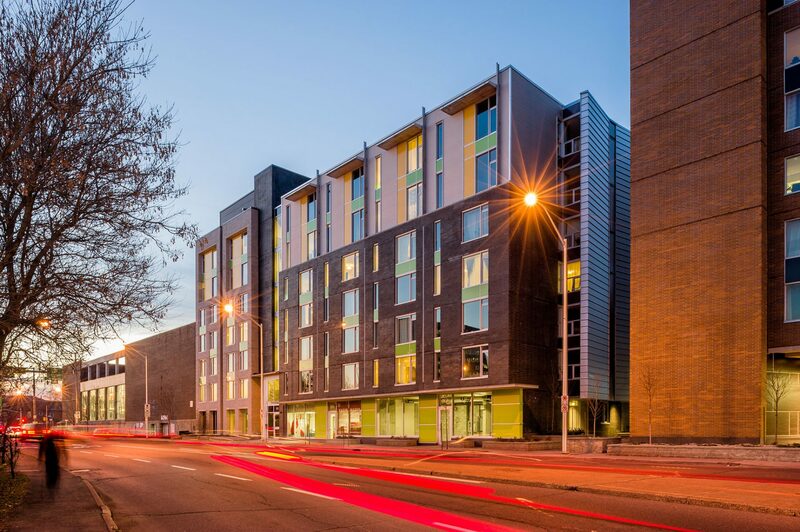 During this period, approximately fifty 600-foot-deep geothermal wells were drilled into the centre portion of the site to provide sustainable low cost heating and cooling for all units. 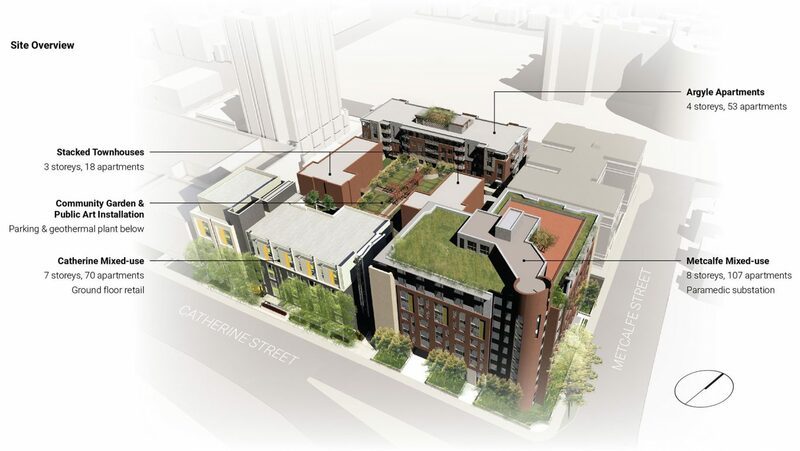 During the second phase, eighteen stacked townhomes and the community garden were constructed above the wells and the seven-storey Catherine building replaced the old paramedic post.